What can we learn from major artists and their marketing strategy? You’re about to find out. This is a guest post via Victoria Greene. If you think you have what it takes to share with The Music Entrepreneur HQ audience, you can find the submission guidelines here. Now it’s time to put your marketing cap on. Having a brilliant song, album, lyric, message, or even image, isn’t everything in music. A musician can excel in each and every one of these areas, but find they are forever playing to crowd of none, on a Tuesday evening, for no money. Getting your marketing spot on can be the difference between your music being the thing that brings you riches beyond your wildest dreams, or leaving you wishing you’d never picked up an instrument. 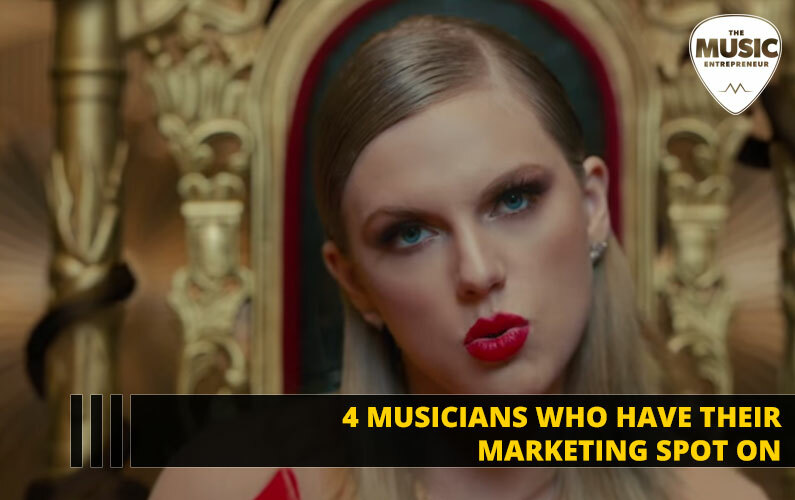 Below I’ve looked at four musicians who have their marketing spot on and explained the lessons you can learn from them. Recommended reading: The New Music Industry: Adapting, Growing, and Thriving in The Information Age. Taylor Swift already had a captive audience prior to the release of her excellent “Taylor’s dead” campaign. Her 2014 album 1989 sold 1.287 million copies in the US alone in its first week of release, and made Taylor the first female two-time winner of the Grammy Award for Album of the Year. But such success didn’t see her rest on her laurels when it came to marketing the follow-up to 1989 – far from it. On August 18, Taylor wiped her social media accounts, deleting her avatars, posts, and feeds, exactly three years after she had released her mega-hit, “Shake It Off”. Cue mass hysteria from media figures, politicians, and her millions of social media followers. Having snared the attention of the music world, her fans, and the media, Taylor followed her social media purge with the release of her single, “Look What You Made Me Do”, in which she explained that the old Taylor was “dead”. The song was a serial record breaker, including having the most Spotify plays for a song in a single day. Reputation (the follow-up to 1989) then became the best selling album of 2017, despite only being released in November. What can we learn from Taylor’s marketing genius? When people think you’re gone, that only sharpens their love for you. And that a calculated “purge” or change of direction can help energize people’s interest in your music and persona. We all love a Phoenix rising from the ashes. How can you do this? Announce you are set to go on hiatus, before announcing your return at a later date. Or, go all-out with a public announcement about how you’re changing direction and “purging” your old self. It just might get people curious about the new dawn. The inspiration for this list. On November 2, 2015, a series of posters featuring lemons appeared in the Manchester hometown of UK indie legends The Stone Roses. What’s the significance of lemons? Three of them were featured on the front cover of The Stone Roses’ hallowed self-titled debut LP, with one forming the “o” in “Roses”. Fans spied an announcement and they weren’t wrong. That evening, The Stone Roses revealed that they would play two huge shows at the 60,000-seater Etihad Stadium in Manchester, along with performing at 2016’s T in the Park. What lessons can we take from this? Give your fans enough information to tease and ask questions of you, before revealing the answer. Everyone loves a mystery, especially when they think they know what the answer is going to be. Clever guerrilla marketing, “inside” jokes, and the strategic use of symbols can all help create hype for an important announcement or release. Imitation is the sincerest form of flattery. Plaster your logo about town with either no text, or a cryptic message. Leave little clues, or run a competition with your mega-fans premised on uncovering a mystery. Ask yourself this: Which musician has the most followers on the largest social media platform on the planet? Justin Bieber? Ed Sheeran? Kanye West? Taylor Swift? The Beatles? You’d be wrong on all counts. Colombian songwriter Shakira has over 104 million Facebook followers, 15 million more than closest rival Eminem. After him, the top 10 includes, in order: Rihanna, Justin Bieber, Taylor Swift, Michael Jackson, Bob Marley, Katy Perry, Adele, and Beyoncé. Clearly, something is going right for Shakira’s marketing (she’s the first person, full stop, to reach 100 million likes on Facebook). What makes her more popular than her peers? The 2016 Brazil World Cup helped her. More importantly, though, Shakira adds lots of content to her Facebook page and every post she creates is sent in a variety of languages. If Shakira is the teacher, then what’s the content of her class? She knows that her fans are everywhere and that someone is always online. Adding regular content keeps them engaged and also means that she regularly shows up in their news feeds. How can you apply Shakira’s lessons? Adding regular content will do you a world of good. Also, while you might not have the reach of Shakira right now, there are ways to improve that. Facebook is a free platform, but it makes its money through advertising. Facebook wants you to buy their advertising and rewards pages that do. Using advertising can help you market your music to more people, increasing your likes and fan base. Given the opportunity to pay whatever you want for an album, what would your price be? $5, $10, $0? That’s the question that UK alt-rock heroes asked of their fans back in 2007, when they released In Rainbows as a pay-what-you-want download. Doing this changed the face of how music was sold and paid for, marketing Radiohead not just to their fans, but the music world as a whole. UK Music Magazine called it “a revolution in the way major bands sell their music”. The average price paid for the record was $2.26. What can you take from this? By sparking a topical debate, you get people thinking about your music – framing an argument that touches on music as a whole around yourself. You can access a broader fan-base than just the people who like your music. How can you apply this to your music? Look at the issues that are topical, not just in music, but in society as a whole, and see how you can add to the debate. Including yourself in the conversation means that you can bring your music to the attention of a lot more people than just your existing fans. Being a brilliant musician isn’t a guarantee of success. Having a grasp of the value of marketing can be the difference between people caring about your music, and people not knowing about your music. So take advantage of the lessons of this article and market your music to achieve the success you deserve. Victoria Greene is a branding consultant and freelance writer. On her blog, VictoriaEcommerce, she offers advice to fellow writers and people looking to develop their marketing strategy.